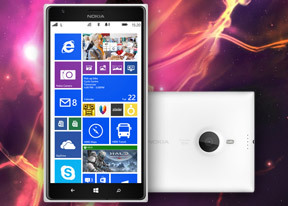 The Nokia Lumia 1520 is just like the rest of the premium Lumia smartphones we've seen, but bigger and faster. The advanced imaging and the custom app selection by Nokia will make the difference against Android phablets, with the Snapdragon 800 making sure the Finn won't feel outgunned. Sounds like a promise for the best experience yet on Windows Phone. A few months ago Nokia was in the headlines for what seemed the wrongest of reasons to people who fondly remembered the Finns from their glory days. Voices were rising once again above the lamenting choir, about what might have been had Nokia gone with Android instead. Oh well, we're well past the what-ifs and should-haves. And no, it's not because Microsoft's check has already been written. Nokia's first phabet has crossed into what was, until now, a strictly Android territory. And not just average droids either, but some of the biggest, meanest species of Android we have seen. The Nokia Lumia 1520 didn't just tip-toe in, looking over its shoulder. Armed with a PureView camera, a 1080p display and a quad-core Snapdragon 800, the Finnish giant entered with a bang! The latest GDR3 version of Windows Phone finally has support for quad-core Krait processors and Full HD displays. There's an attempt too, to make better use of the size and resolution by adding an extra column of contents across the interface. It was about time Microsoft brought the platform back in the hardware race and we are delighted to finally meet the first Windows Phone to aim for the pole position. At first glance the Lumia 1520 looks like a magnified Lumia 1020 - it has the same design and build, only without the camera hump. The trademark unibody is the right bit more impressive at that size, while the PureView camera has lost some of its sensor area and half of its pixels, but hopefully kept the amazing image quality. Nokia's Lumia Black update isn't bringing as many new features as Amber, while the GDR3 version mostly makes sure the OS would happily accommodate the new chipset and screen resolution. Users will perhaps have to wait for the 8.1 update for a notification center (hopefully) and a file manager (not too likely) among other things. Yup, the Lumia 1520 sounds just like what the doctor ordered for the ailing Nokia cellphone business. It makes us sad that they've decided to scrap any future effort altogether, but that doesn't mean it won't be closing the show with a bang. We may be well into their farewell season, but the finale is not close. It's too early to write Nokia off just yet - what we have ahead seems like the climax of its work. And the hardware inspection of one of their finest specimens is just a click away. So, shall we?